About mid-September I'm going to be teaching a Forest Unit. So I thought it would be fun to do a couple of experiments related to trees. One of the first ones we'll do is called "Striped Celery". This is the experiment that shows the kids how plant stems and tree trunks carry water from the roots up to the leaves and flowers. Celery is cut and placed in coloured water. After about 30 minutes you can see the effects of the capillary action. 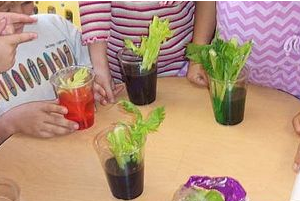 A cool extension of this experiment is to repeat it using stalks of celery without leaves and then comparing the capillary action between leafless and leafy celery. The kids will be able to see that the stalks with the leaves draw the water further up into the stem. Cool, huh? A clear indication of the importance of plant foliage! Love the picture you made with Photoshop! 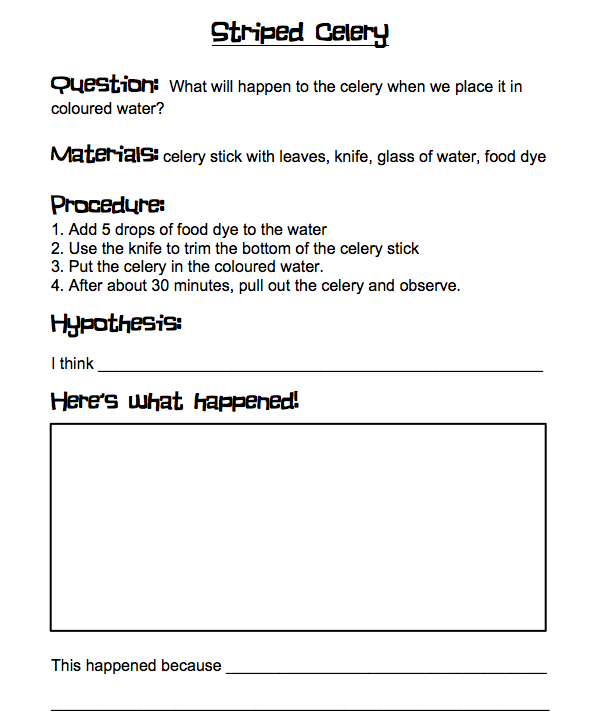 Your students will love the celery experiment! Thanks for the experiment idea and recording sheet. Love the pop art poster too! You did a great job with your son's picture! I'm excited to try out your different experiments. I love the recording sheets your are making! Thanks! I have never thought of looking at the bottom of the celery after putting it in the food colouring - always just looked at the leaves. Brilliant. I just drove through Seattle last week on vacation! I love the northwest! !